People often say to me: “It’s your busiest time of year!” They have a point, there is lots going on. But it is a nice busyness really, and it is a great time for meeting people who sometimes don’t make a regular feature of coming to church. But don’t worry, no one is counting and we are always pleased to see people and share with them the joys of the season. On the theme of being busy, for most of us Christmas is a time when we can take a few days off with friends and family and get some R&R. Relaxation and Recreation. Recreation, which should be seen as re-creating ourselves, re-generating ourselves. From the Christian perspective this is also spending time with God and letting Him re-create us into the people He made us and wants us to be. I usually manage to make space during the day for quietness, when I can reflect and bring the concerns, joys and tasks of the day into focus and offer them to God. 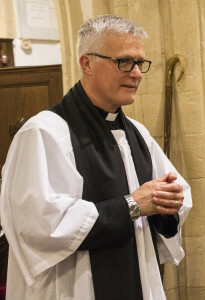 At this point you may well say that it is fine for me to do it as I’m a vicar and that is what they do. But that is not correct, we should all put aside a little bit of time each day for quiet reflection, and be with God if that is your creed. All you need is a chair to sit on in a quiet place in the house or office even. You may find that with the mad rush towards Christmas this will help keep the important part of the forthcoming celebration in focus. Try it you may well be surprised! As well as the services in church, all of which will be listed on our benefice-wide Christmas cards, we have other activities going on. During December we have a series of Advent Groups meeting to look at and discuss ‘the Bible’; further details from the benefice office. On Sunday 23 we will be needing volunteers to help make the Christingles for the Christingle services. If you would like to help come along to the Benefice Room in Milton after the Sunday service from 10:30 to midday. May I take this opportunity on my first Christmas with you to wish you all a Christ filled Christmas and a Happy New Year and that when you finally get time off you find space to relax, recreate and enjoy time with friends and family. It would be lovely to meet and greet you at any one of our Christmas services.